Announcement As seen on The Today Show and Good Morning America! Home of the original vintage map wine bottle stopper. Handmade jewelry and housewares made from vintage maps and other ephemera. Live in Columbus and want to pick up an order at our studio to avoid shipping charges? Use code LOCAL at checkout (not valid for pillows, blankets, totes, mugs, travel mugs, or clocks). As seen on The Today Show and Good Morning America! Home of the original vintage map wine bottle stopper. Handmade jewelry and housewares made from vintage maps and other ephemera. Gorgeous! I love, got three for my new office. This was a custom order of a Kentucky map on the blanket. It is perfect. The blanket is very soft. The map shows my husband's place of birth and it was a birthday gift. He loves it. This compact will make a great gift. It arrived quickly and looks very nice! 10 friends are traveling to Italy together in May. One of the friends ordered these to surprise the others. I wonder if there's room for an 11th? From Anoka, MN to Anaheim. 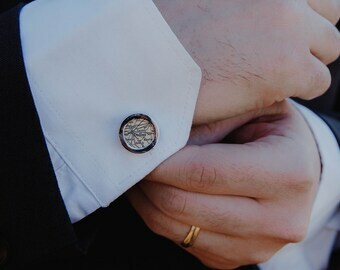 A custom cuff link set reflecting life changes. Our wine stoppers on the Today Show! Columbus, Ohio-based Daisy Mae Designs celebrates the special places in your life, whether it’s your hometown or your favorite vacation spot. 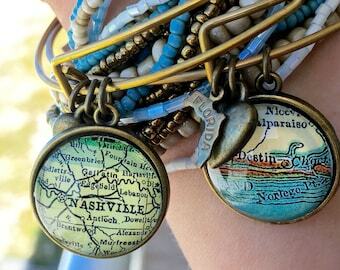 Owner Kristy Sickles creates jewelry and housewares from repurposed vintage atlases and maps, rescued from a lonely basement or attic and upcycled into a meaningful and personalized keepsake. I create pieces from repurposed vintage atlases and maps, rescued from a lonely basement or attic and upcycled into a meaningful keepsake. I find relaxation in creativity. I also find relaxation in margaritas, but that's another story. Matt is a recovering home remodeler and current IT professional. Matt creates handmade goods through his woodworking at markets. He supports Daisy Mae Designs in all ways possible. You’ll also find Matt representing our brand at retail markets. Wendy joined us as a production assistant in 2016. She is amazing at helping us think of new ways to market our products and simplify our processes. You'll also find her representing our brand at retail and wholesale markets. Marsha joined us as a Production Assistant in 2016, as the crazy holiday season geared up. She makes products for shows and shops, expanding our reach this year. You'll also find her representing our brand at retail markets. Jen joined us as a marketing assistant in 2017. She helps prepare and execute wholesale markets. You'll also find her representing our brand at retail markets. Provides printing services to materials from our vintage map collection. I take pride in the quality of my creations, so if you have any problems with your item(s), please let me know. Returns are only accepted in the case of defective products. Photographs of damage are required. Any other returns are at the discretion of the shop owner. For returns approved by the shop owner not resulting from a damaged product, shipping fees are not refundable. Buyer is responsible for return shipping fees and refunds will be processed once item is received by seller. Custom orders are not returnable or refundable. Choosing Shipping Upgrades does not include a rush in creating the order; only shipping the order. Please note "Ready to Ship in" timing under Shipping & Policies for an estimate of when your item will ship. Contact me if you need an item sooner. Insurance is not included in shipping fees, but can be happily added by including a comment to seller at checkout. Delivery confirmation is included for US orders. You'll receive an email with your delivery confirmation number. For international orders, only Express mail provides order tracking. Please note that delivery times vary significantly due to customs! Parcels typically take 2-3 weeks to most locations, but it can be longer. Due to potential hold ups in customs, 45 days must pass before an international insurance claim can be filed for a refund. There is no tracking available on international first class packages once they leave the US. Please be aware that your own country's customs service may impose a range of import fees, taxes, tariffs, duties at the time of delivery. These are not in my control and I have no way of knowing when or if they will be imposed or how much they might be. For information you should contact your local customs agency. You are responsible for any import fees, taxes, tariffs, or duties at time of delivery. I indicate your price paid on the customs form and include an invoice in the package.